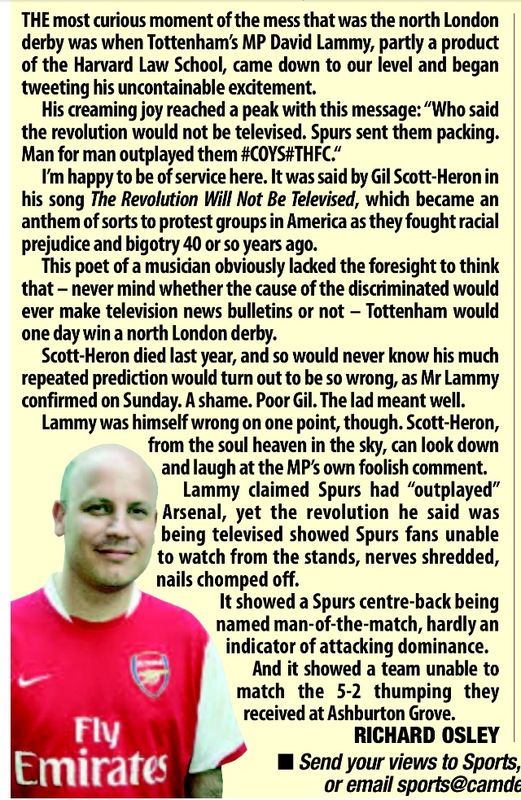 And yet Lammy is a curious chap to watch in action if you can ignore his blind love for the Hotspur just for a moment. He represents a constituency full of disadvantage with the care and understanding of a local… and a finished accent of a pitch rarely heard on the High Road. He complains that Tottenham has no local newspaper, then tweets how he has written an exclusive article for the Tottenham Journal. Most striking is his ability to deliver great crescendos in his speeches. On the First Whittington March in 2010, I was struck by the most explosive speech he gave against the threatened closure of the A&E department. He vowed that ‘a black man would be chained to the doors’ if the plan went ahead, demanding that ‘Arsenal fans stood with Tottenham fans across north London to fight the closure’. That may have been a bit of crowd-pleasing tub-thumping, but ahead of the Second Whittington March, now just eight days away, Lammy still remains a politician whose critical question, key to the whole debate, has been left unanswered.